With Advance Measuring Values, you can cherry pick what live data you wish to view/log. Without getting into too much detail here, on UDS Modules you have to use the [Adv. Meas. Values] function, and on non-UDS modules, if we (Ross Tech) have documentation in the form of a label file for a given control module, then the [Adv. Meas. Values] is a bonus feature. 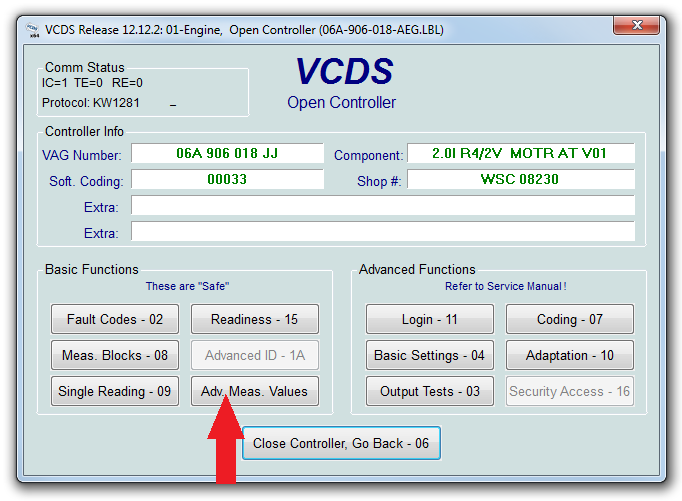 We often get asked by customers how can they see what all data a given control module can display. If there is a label file for a non-USD module, then you can click on the [Adv. Meas. 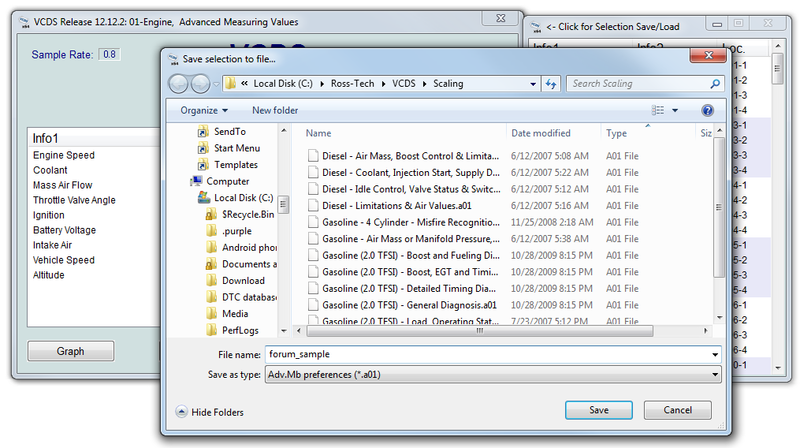 Values] button and get a list of the documented data Ross Tech has. Now this will be the same data as with [Meas. Blocks - 08], but as noted, you can cherry pick what data you view. You can create lists and save them for later use as well. From the Open Controller screen, click on the [Adv. Meas. Values] button. In the example above, I've gone ahead and cherry picked the live data I wish to view/log. This is the same data as in Measuring Blocks. Notice on the smaller window on the right, the "Loc." column, the 001, 003, 004, ect, those are Measuring Block Groups numbers. And the -1, -2, -3, -4 are the fields 1 to 4. There is no 002 listing because the label file doesn't have information on Measuring Block 002. So after I've checked off the values I want to view, you can save these settings, click on the tiny VCDS icon that the red arrow is pointing to. From the drop menu, click on "Save Selection to file..."
Give the file a name now, "forum_sample" for demo purposes here, then click on [Save]. Now if at a later date, I wish to view those same cherry picked values, go into [Adv. Meas. Values], click on the tiny VCDS icon, select "Load selection from file..." and locate the profile I created. Ross Tech has included several helpful profiles as well. Last edited by Jef; 02-01-2018 at 08:21 PM. Is it possible to create custom measuring block files while not connected to the car? I've only tried working with these while sitting in the car, but it would be advantageous to work on building custom files for later use. Thanks. It is possible, but you have to do it "by hand" (using Notepad). It would take a considerable time to get all 1000, so even if we did this, it would not constitute a "snapshot". i have only adv meas values. My engine is 1.2tsi 8v. Your ECU uses UDS protocol. There is no "block 93" and I'm not sure what values would correspond to the data that would be found in block 93 in older ECUs. I used Advanced Measuring Values when checking whether my fans were coming on ... or not. I could watch the temperatures at the radiator OUTLET, at the radiator INLET ... and the precise temperature at which the fans turned ON ... and OFF. What was interesting is ... the fans are variable speed ... so they might only run at 10% speed initially, or they might increase in speed if cooling requirements were greater. That's why I couldn't "hear" the fans running ... I thought they were broken! Last edited by neatyhawker; 11-08-2017 at 01:16 PM.